Ohmishima in the center of Shimanami-kaido, where there is a monument of the sacred site of the cyclist. Ohmishima is an attractive island for cyclists, as an architect "Toyoo Ito" is doing the activation of "The project to make Ohmishima the most beautiful island in Japan ". This page introduces recommended course for beginners cycling Ohmishima. The start of Ohmishima comes from "Tatara-Shimanami Road Station"
The start of Ohmishima's cycling will start from sacred site of the cyclist' Station Tatara-Shimanami Road Station '. Among Shimanami-kaido you can look over a particularly beautiful bridge "Tatara Ohashi", "Monument of the cyclist's sacred place", "Happiness bells" etc. It is full of photogenic places. Let's ring the bells of happiness. 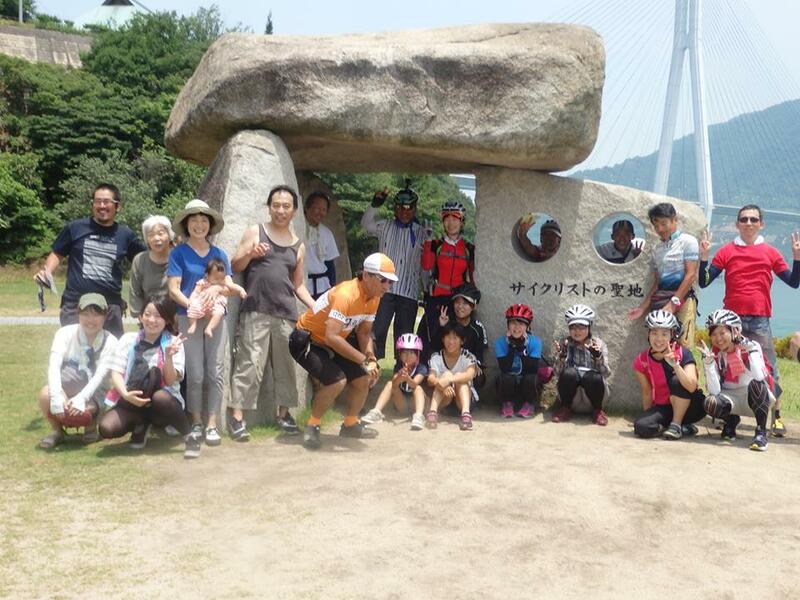 The cycle stand next to the monument of the sacred place was the winning prize for "cycle stand design contest" with the name "six cyclists and tourists"
Initially there were six units in Imabari city, but now you can see it on the island everywhere. I use a little head for how to use the stand, but since I have a drawing of how to stop, please try it. This park is in a road station so parking lots can be used for free. Those who can bring a bicycle by car can recommend Ohmishima's cycling by placing the car to the parking lot of this Tatara so it is recommended. Parking lot is wide, and there are 300 parking spaces, so it is almost never full. When you come to Ohmishima, I want you to go to Ohyamazumi Shrine. Even if it says anything, it is feasting the god of "Japan total compassion". 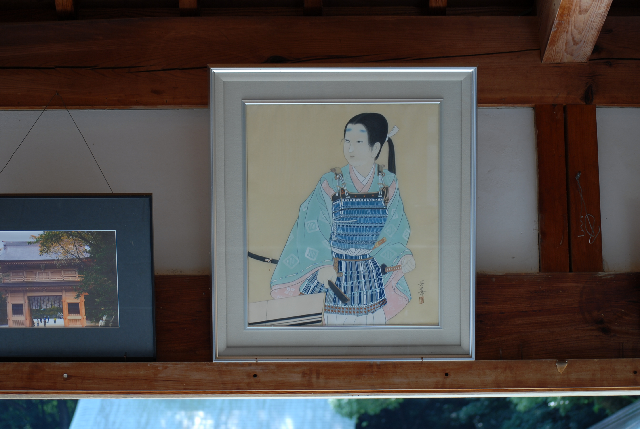 It is said that this princess of Ohyamazumi Shrine. Joan of Arc in Setouchi "Tsuruhime"
It is reported as the princess of this Oyama god shrine. KEI is in the "daughter of Murakami pirate"
"Even Tsuruhime Mishima Omijin-sama will do it"
I am just trying to justify my behavior. This Mishima Omijin is Ohyamazumi Shrine in Ohmishima. The main facilities and meals of Ohmishima are gathered around this Ohyamazumi Shrine. It is reputable as cheap and tasty, and always has a queue. Also a seafood meal called "TAIRYOU(大漁)"
It is in front of this Ohyamazumi Shrine. Recently Sunday became a regular holiday, the price of specialty seafood rice bowl seems to have changed, I can not see the matrix as much as before. By the way, I recommend a restaurant called "KITUNE-NO-BOTAN(きつねのぼたん)" in the immediate vicinity of this big catch. Every year in Ohyamazumi Shrine, the event "Tsuruhime festival" will be held in July. At the Tsuruhime festival, women selected from talents and local residents as "Tsuruhime"
I ride on a mikoshi and go for it. It is highly recommended event. Photograph collection of Tsuruhime by Kawakita Mayuko? In 2014, Kawakita Mayuko played Tsuruhime. Children can also cycling safely. It will be time to spend climbing. When you come to the top of the pass, the rest is downhill. Moreover, it joins the general road from the top of the pass. Ohyamazumi This course is to return the way we used to go to Shrine. Those with children can restore with ease. But, if you think "I want to run another course a little more because I came to Ohmishima," I think we can recommend a southern course rather than a northern course. A course on the south side of the course on the north side is recommended after leaving Ohyamazumi Shrine. However, it is quite hard. There is considerable up / down. I think Ohmishima here is on the hard level. I think that it is a hard pass, contesting 1,2 in Shimanami-kaido. This is because you can enjoy the cycling of Ohmishima. 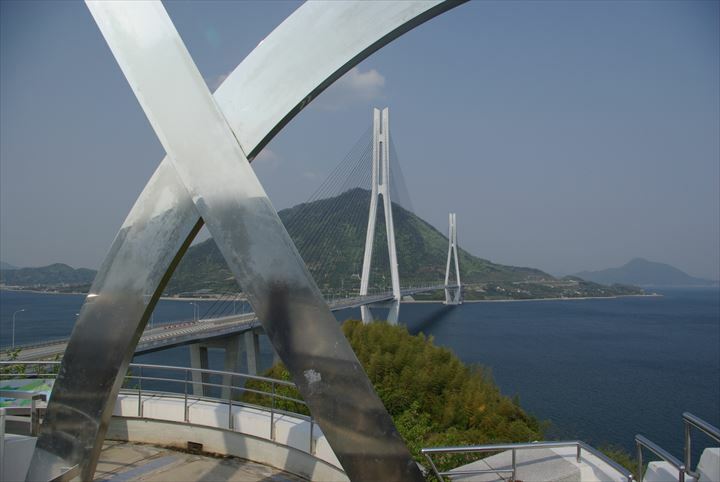 Such as "Museum" and "Toyo Ito Architectural Museum"
It is the scenery of the sea in Setouchi spreading in front of you when you run down the slope. Even though I am running, I feel very comfortable. This page introduced the recommended course for Ohmishima cycling beginners. Especially the southern route of Ohmishima, introduced last, is very pleasant and full of places of interest, so those who are accustomed to cycling are one of the routes that you want to run. Besides that, Ohmishima is an architect, Mr. Toyoe Ito, who was with the residents, also developed wineries and cafes, one of the spots that we can keep an eye on. Come, Ohmishima Please put it in the plan of manami cycling. Ohmishima has plenty of places to see in addition to those mentioned here. Once you have recommended information, I would like to introduce it again, so it would be greatly appreciated if you would like to bookmark. Speaking of books recommended for beginners, it is definitely "Shimanami Island running book(Shimanami Tou-Sou Book)". Anyway, this book introduces funny place of shimanami and place to pay attention to who is a cycling guide with Shimonami "Utsunomiya Issei" It is a book that I am doing. It is a great thing that if you have this book, you do not need any other books at all. Kazunari Utsunomiya is a wonderful person who is I've been traveling around the world on my honeymoon with two passenger bike. There is no doubt because it is a book written by Mr. Utsunomiya. When departing from Imabari side of Ehime prefecture, departing from the cycle station "Sunrise - Itoyama" is a course recommended for beginners. 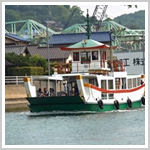 The first step from Onomichi to Shimanami-kaido is to go across Mt. Mukojima by the ferry across from Onomichi. 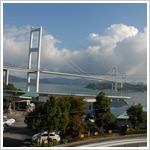 Unlike Shimanami-kaido's bridge, the bridge connecting Onomichi and Mukojima is a bicycle-less bridge.